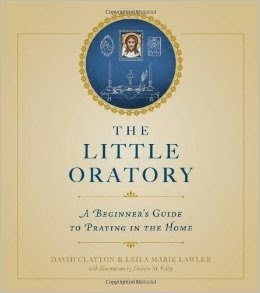 The Little Oratory, have you read it? I'm about 1/3 of the way through it, though I've already flipped through and skimmed all of it and I'm really enjoying it. My friend Christy told me it was the end all be all of "how to have a Catholic home" books and she was right. Wow. Auntie Leila and her co-author David Clayton have thought of every little detail and share the information in a pleasant, almost conversational tone. The book is filled with the what, when, where, why, and hows that probably every Catholic parent has asked at least once. How do I get my kids to pray? How do I find time to pray? How do I bridge the gap between Church and home? How do I make our home a true domestic church? How do I bring order to this chaos? 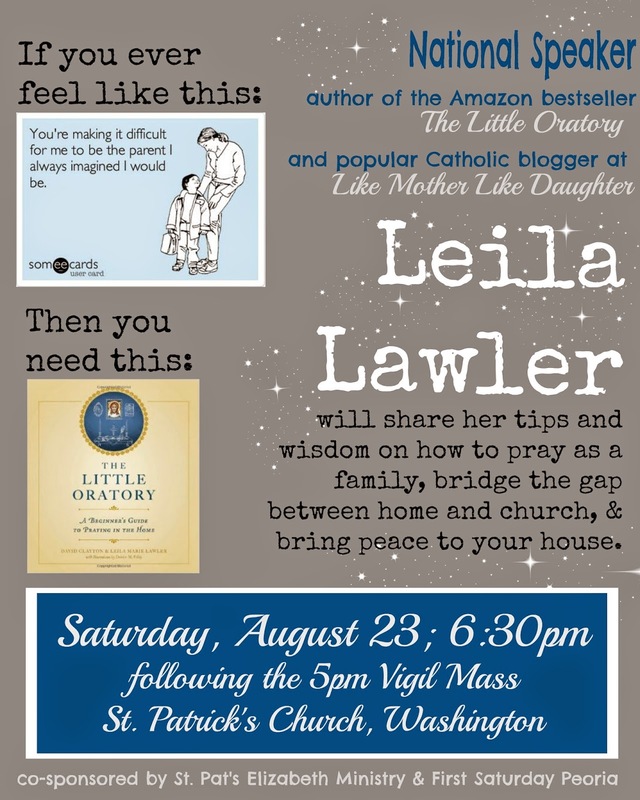 Leila, who has shared so much of her wisdom from being a mom of seven, is sweet, open, and encouraging in The Little Oratory. Her daughter, Deirdre, did many of the illustrations and they are beautiful. The book really is a great addition to every Catholic bookshelf. Not every suggestion they make will click with the dynamics of every family but I really believe there is something for everyone in the book. Which is why I'm SO EXCITED that Leila is coming to speak at my parish later this month AND is giving away one free copy of her book to one of the A Knotted Life readers! Woo hoo! If you're in the greater Peoria, IL area and would like to hear Leila speak you can learn more information by clicking on the image below or going to the Facebook event page. To win a free copy of the The Little Oratory just enter the Rafflecopter below. I won't be at the St. Pat's talk, but enjoy! I'm not in Illinois, but would love to win! I'm trying to talk a friend into a road trip! I wish! Live too far away! Blessings on your "Little Oratory" event -- it will sow so many seeds of prayer in those who attend! I've been slowly reading through it this summer via library copies, but they're in high demand and I'm a slow reader; so I would love to win a copy to share with hubby and our 8 kids! I won't be at her talk, but love a chance to win her book. Wish I could be there, but I would love to read the book! I wish I could be at the talk. This looks like a really incredible read. I'm too far away to come to the talk, but maybe she can come speak in Michigan soon! Wish I could come to the talk, but I would love to read the book! I wish I could go, but we are going to be out of town that weekend. I can't go, but I hope I win this! Did I say that?! Are you misquoting me Bonnie Engstrom!? No, you're not, I'm on the Auntie Leila bandwagon! And I knew you'd really enjoy it, but I'm so sad that I live so far away from you and you can't organize my social life with these amazing events you whip up. Sorry to miss it! Probably not, but I wish I could!!! I probably live as far away from Peoria as Auntie Leila does, so I can't go, but this would be a lovely consolation prize! Too far for me to make it, too bad! Far too far for me. Looking forward to reading the book one way or another! Would love to go, but I'd be just as happy with this book, too! I live too far away, I can't make it. :(. I hope the event is a resounding success! I would like to win a copy of the book. If I lived in Peoria! No, I won't be at the talk. Have a great time! I'd love the book though. No, sorry, I will not be at the talk. Won't be able to come to the talk, though I will be thinking and praying for you. Can't wait to hear your take on it. Would love to read the book! Sadly I won't be able to make the talk. No luck...I'm stuck on the East coast. Is anyone planning on recording a podcast of the talk? Not sure if my comment posted..so just to be sure - no I won't be able to attend. Bit far from Oz! Ugh! If only I still lived in the Peoria area! I'd love to hear her speak!!! Enjoy seeing it and I'll have to check out this book I've heard so much about. I know I love their blog. Sounds like a wonderful book! I am sure she is a great speaker. Sounds like something I would really enjoy! I've heard so much about this book. Hope to win! If we were in the area, I would totally be there. Thanks for the opportunity! I live way too far away to attend the talk at your parish, but that's so great she will be there! No, wish I could, but I live a couple of states away. I probably won't be able to make it since we were just down there end of July. But I definitely do want to read the book! We don't live too far. Would love to come. I am hoping to come--thank you for organizing the talk! A big chunk of land between me and there won't allow me to come, but I can't wait to hear about it! I've been dying to read this book! Soo far away! Otherwise, I'd be there! This would be the PERFECT new baby gift for a mom who has two little ones at home...and of course I'd like one for myself too (but beggers can't be choosers!). This book is on my wish list! I would love to read it! Is it too late to enter?? Thanks for the chance in the giveaway ! Anne W.
If we still lived in St. Louis, then yes!